BANGI, 28 Nov 2013 – Electricity and gas companies in Malaysia should give more grants to scientists to tackle real-life issues of engineering such as the use of alternative fuels. Professor Yong Yan of the University of Kent, UK, said there is mutual benefit if power utility companies consult local university researchers for resolving problems or upgrading their systems. Prof Yong, who was giving a public talk at The National University of Malaysia (UKM) here today said in Britain where he does research in engineering, the power utilities routinely consult researchers. Answering a question from a UKM researcher, he explained that the private sector in the UK would give grants to scientists if it deemed there was an opportunity to make progress through research. In his talk Instrumentation and Measurement for Coal and Biomass Fired Power Plant Optimisation, at UKM’s Institute of Space Science (ANGKASA), Prof Yong said the UK had successfully converted almost all of its electricity generators from coal-fired to biomass-powered. With the switch, he and other engineering researchers were approached by the utility companies to provide methods on improving the combustion of a wide variety of fuel sources. The challenges facing the British scientists were formidable; with environmental legislation becoming increasingly stringent and many power stations operating under variable sources. However, the research had paid off and the power-generating industry is constantly seeking new ways of improving the use of biomass fuel and profitability. He said thanks to the diligent work of the researchers who were given sufficient grants from industry, a range of new sensors and instruments are available for the optimised operation of coal and biomass power plants. He added that the tools, sensors and instruments needed for the industry have become more cost-effective, robust and reliable, despite the challenges. Among the problems the utility firms wanted to be resolved is the installation of new burners to replace the coal-powered boilers. The engineers have even managed to install economic generators that use both coal and various kinds of biomass. Present at the talk were ANGKASA Director, Prof Mohd Alauddin Mohd Ali; Assoc Prof Dr Edmond Zahedi of the Faculty of Engineering and Built Environment and ANGKASA Senior Fellow, Assoc Prof Wayan Suparta. 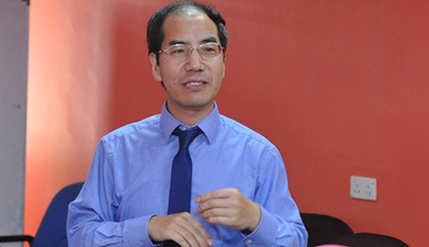 Prof Yong received his BEng and MSc degrees in instrumentation and control engineering from Tsinghua University, Beijing, China in 1985 and 1988 and his PhD in gas-solids flow measurement from the University of Teesside, UK in 1992. He joined the University of Kent in 2004 as a Professor of Electronic Instrumentation and the Head of Instrumentation, Control and Embedded Systems Research Group. He has been Director of Research of the School of Engineering and Digital Arts since 2008. He has published in excess of 280 research papers in international journals and conference proceedings in addition to 12 research monographs. His h-index is 27 with over 2200 citations. He currently serves as a member of the Innovation Metrology R&D Working Group and the Engineering and Flow Working Group of the UK Government.